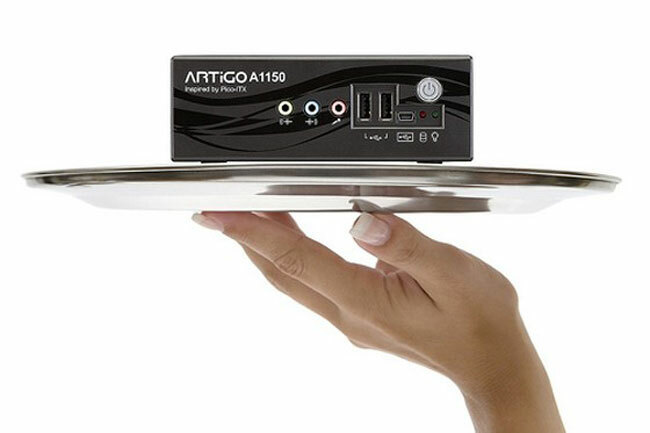 VIA has released another small form factor PC, the VIA ARTiGO 1150 barebones nettop, and the device measures 5.7 inches by 3.9 inches by 2 inches, and it is powered by a dual core 1GHx VIA Eden X2 processor. The ARTiGO can take up to 4GB of RAM and there is room for one 2.5 inch SATA hard drive or solid state drive (SSD), plus it comes with five USB ports, HDMI, VGA, Gigabit Ethernet, the video below shows just how small it is. There is also one USB device port, three audio jacks and it also comes with optional modules which include an SD card module and a WiFi module, and it retails for around $265.